Lock in a great price for XTILU Hotel - Adults only - – rated 9.2 by recent guests! This is an exceptional hotel in a decent neighborhood a short walk to the main square and many of the main tourist sites. I personally liked it because it wasn't right in the middle of the (noisy) tourist area. The rooms are large and simply but nicely appointed. They face one of two courtyards. Breakfasts are made to order and quite good. Very friendly staff. The breakfasts were wonderful...variety and well prepared- a treat each morning on what to select. Breakfasts were amazing - staff was incredibly helpful and the Zocalo is just blocks away! We really enjoyed our stay here. The atmosphere was very quiet and serene and the courtyard was beautiful. The silence - although close to the centre, there was nearly no noise from the surroundings (traffic, music from bars in the neighbourhood etc.). The staff was very friendly and knowledgeable when we had some questions about where to go. We really enjoyed the breakfast in the sun of hotel's patio. This is a great place to stay! A small hotel with rooms on the ground and upper level, it is extremely peaceful and quiet. The room was very clean and spacious. The breakfast was delicious with a varied choice on the menu. .I especially enjoyed the freshly made carrot juice.The staff members were so helpful especially Nancy. She booked the taxi for a ride to airport and helped with many other tips on navigating and touring Oaxaca. The hotel is not in the center of town but is an easy walk to the attractions, dining, and shopping. If you are looking for a hotel with a bar and restaurant this may not be the place for you. I would tecommend the hotel for anyone lookong for value, tranquility, and good service, Thanks again for lovely stay! The hotel is perfect, great room, breakfast and staff. XTILU Hotel - Adults only - This rating is a reflection of how the property compares to the industry standard when it comes to price, facilities and services available. It's based on a self-evaluation by the property. Use this rating to help choose your stay! This colorful, Mexican-style hotel is located less than 1,300 feet from Oaxaca’s Zocalo plaza and features free breakfast, an on-site bar and dry cleaning services. Each room at XTILU Hotel features a flat-screen TV with cable channels, a safety-deposit box and free Wi-Fi throughout. They also come with a hair dryer and a private bathroom with a shower and toilet. The property’s on-site restaurant serves traditional cuisine, and guests will find other dining options within 650 feet. There are also several bars within 1.2 mi of XTILU Hotel. 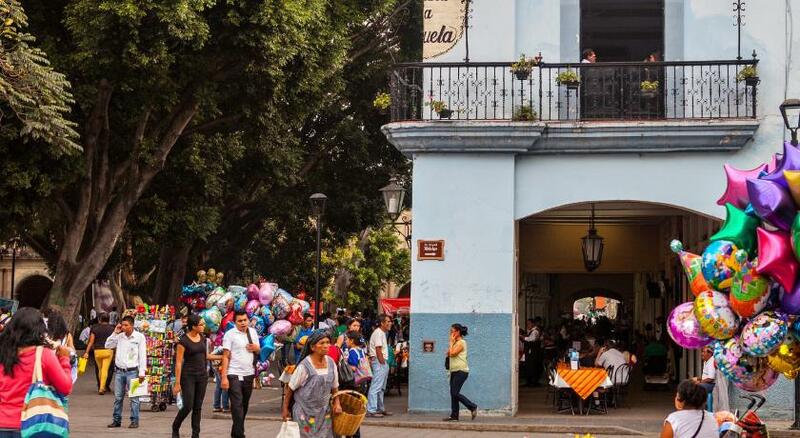 The city’s popular Mercado Benito Juarez market is 1,650 feet away, while Monte Alban archaeological site can be reached within a 20-minute drive. Oaxaca’s International Airport is less than 5 mi away. When would you like to stay at XTILU Hotel - Adults only -? This air-conditioned room features a wardrobe, flat-screen TV with cable channels and a safety-deposit box. The private bathroom includes a shower and toilet, and free Wi-Fi is available throughout. 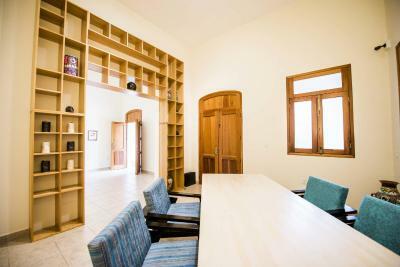 This air-conditioned room features a flat-screen TV with cable channels and a private bathroom with a shower and toilet. Guests will also find a safety-deposit box, a wardrobe and a small seating area. Free Wi-Fi is available throughout. This comfortable suite is totally air conditioned and comes with a seating area and a flat-screen TV with cable channels. There is also a safety-deposit box, and the private bathroom offers a shower and toilet. Free Wi-Fi is available throughout. House Rules XTILU Hotel - Adults only - takes special requests – add in the next step! XTILU Hotel - Adults only - accepts these cards and reserves the right to temporarily hold an amount prior to arrival. Please inform XTILU Hotel - Adults only - of your expected arrival time in advance. You can use the Special Requests box when booking, or contact the property directly using the contact details in your confirmation. Even though the bedroom was tucked away in a back corner of the property, it was still noisy at night due to barking dogs. Not their fault, but not very restful. Mosquitos everywhere, no hot water the first couple of days, but they quickly remedied the problem each time. Extremely weak internet signal in the bedroom, even when we switched to a different room. They said there was nothing they could do about it. Stayed there 5 nights. Easy to walk to centro. The breakfast was plentiful and delicious, Dining room was light and airy. The desk staff and dining room staff were friendly and very helpful.The open terrace in the middle was peaceful and relaxing. I was a little disappointed that the property had no real atmosphere at all. Staff were very quiet but friendly. Only saw another guest once. Feels rather segregated. My room had very little natural light available to it and the bathroom had no ventilation. Which will probably become and issue in time. The property was very new, pretty and the courtyard for breakfast was just beautiful to sit in. Food was also incredible. Very modern with lovely artistic touches. Room was comfortable and I did enjoy my stay. No amenities....no ability to store beverages in the room or have food available other hours than morning. Tiny tiny bathroom. Limited hot water. Sewer gas smell in shower. Learned to cover up drain with bath mat. It was far from the touristy area, we had no key for the outside door (staff / doorbell to access), no nearby shop, no fridge in the room, no smoking except on the street, no hot water, very expensive for what it is, sent a very pricey airport pick up instead of simply explaining the taxis are plentiful & cheap. Dogs barking next door. Quite loud with the layout, all of the rooms face the inner courtyard. The nearby restaurants were ok but didn't seem worth the 4+ stars that trip advisor reviews gave. Breakfast is nice, included, staff were nice. We only booked here because we wanted Ac and then we didn't even use it. The decor etc is simple, for the price we expected more of a luxurious feel in the rooms. The only improvement would be a pool! The bed was very very hard and we asked to have a pad and the staff complied that day. 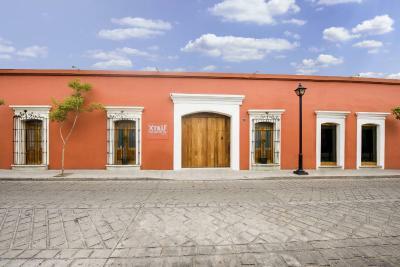 Parking was difficult, but that's true for most of the accomodations you can find in Oaxaca.